Home » Credit Cards » Breaking News: Massive Equifax Data Breach! Breaking News: Massive Equifax Data Breach! CNN is reporting that Equifax has experienced a massive data breach of up to 143 million customers. Considering the current US population over the age of 18, that’s more or less every US adult. Equifax is a credit reporting service, one of three bureaus in the United States, that maintain extensive levels of personal data including Social Security Numbers. According to an Equifax statement on the matter, the personal information of over 209,000 individuals has been exposed along with credit card details. The company further states that more than 180,000 such customers were in some form of a dispute process with the bureau. I found myself in that category, so I am particularly concerned. Data breaches have occurred at Target, Sony and Hilton in recent years; IHG has also been hit with sporadic, location-specific point-of-sale security breaches of this magnitude. While Equifax has reported that there have not yet been confirmed ill effects, it is offering customers extended identity theft and credit monitoring. While there are more questions than answers at this point, it does appear that the bureau has a decent amount of evidence and has thoroughly investigated the breach. They note that it is suspected to have taken place between May and June 2017 and have only announced today, suggesting to me that they feel they have adequate information on the breach. Credit reports for Canadian and UK residents might have also been affected. On your designated enrollment date, please return to this site, www.equifaxsecurity2017.com. For security purposes, you will be asked to re-enter your last name and the last six digits of your Social Security number. 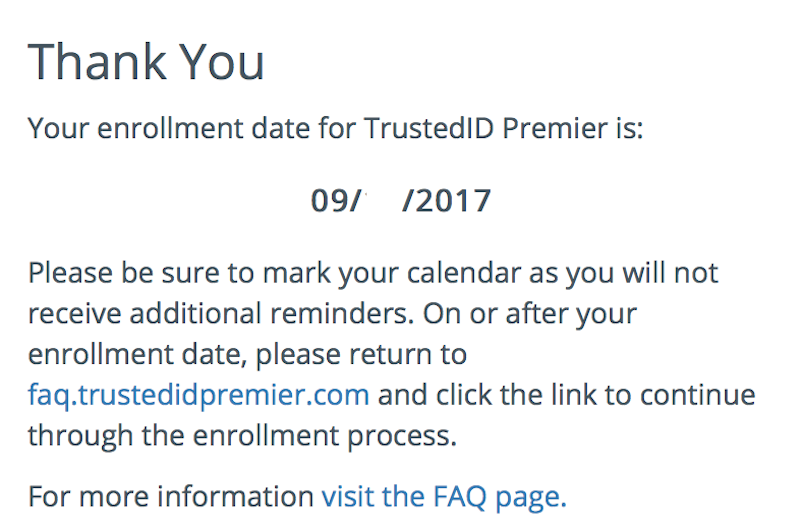 To enroll in TrustedID Premier, you will be asked to provide additional information to verify your identity. You also will need to provide a valid email address in order to complete the process. Within a few days, you will receive an email with a link to activate TrustedID Premier. Please be sure to check your spam and junk folders if you do not receive your activation email within that timeframe. I’ll update as more details become available and as to my own experience. Previous Article New Houston to Sydney Flight on United Airlines — Too Long? How would they even know your email address based on this information. That seems odd. I was impacted and got the same screen you did. My wife was not but it let her click a “go ahead and enroll” button anyway and she got the same type date to enroll. This is super weird. I agree with your statement. Why not let you enroll right away. Bizarre. The only thing I can think of is that it’s a security process. Perhaps Equifax doesn’t allow people access right away in case that the database used to confirm eligibility would itself a backdoor to accessing the data? Pure conjecture on my part though. If it’s not a security concern it’s possible the dumbest marketing move I have ever seen. Very poorly handled, and clumsily managed to allow people to enroll. Why the heck must anyone wait to enroll? Equifax looks like the monopoly it is. Bill, I don’t get the delay and they have clearly had months to prepare. I wouldn’t be surprised if they have most of these materials in place already in case a breach were to every happen, so the delayed rollout is strange. In fairness though, Equifax does not have a monopoly as they also compete with TransUnion and Experian. Well, actually, thinking that through, it’s not a monopoly but more of a “tri-opoly” as the three together really do have the market cornered. So although it says my kids weren’t impacted, I wanted to go ahead and sign them up for trustedid anyway. Seems like locking their credit would be a good move. Getting the error message “You must be 18 or older to register.” What a disaster. If I was a hacker I’d be targeting minors since there seems to be no way to lock their credit.